My intention was to transform the health care experience in a positive way. The deepest of human emotions are at play in a hospital: fear, hope, compassion as well as a profound experience of faith and transitions. Art has a healing effect that is immeasurable. This project consists of two 25’ long windows on either side of a hallway. On one side the panels are 8’ tall and on the other side 7’ tall. 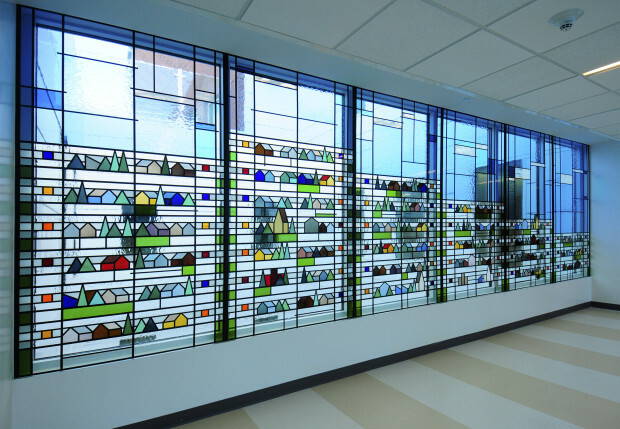 Together they create an art glass environment through which patients, staff, and visitors travel. The space allows for a colorful interplay of light and glass. This design speaks to the international neighborhoods and unique mix of cultures that make up modern San Francisco. The art experience is inclusive like the city, which prides itself on welcoming everyone of any age, gender, identity, primary language, or immigration status. The long exterior court windows feature a design that is both child-like and a sophisticated abstraction. The details feature tiny streets, houses, places of worship, stores, trees, parks, schools, other buildings, clouds and sky. 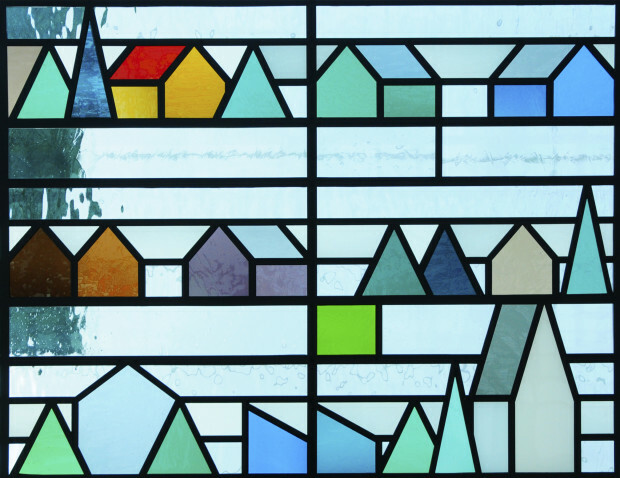 The design makes for a colorful and uplifting patchwork which speaks to the diversity of San Francisco. The stepped design of the hills also references the theme of transition in, for example, the aging process or the experience of healing itself. This vocabulary is universal and celebrates community. Traveling through the hallway in effect immerses one within the city. 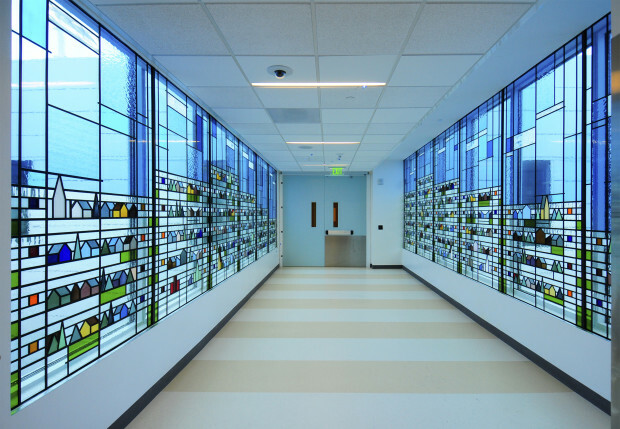 With so much variety in the design graphics and the natural light transitions of time of day and seasons, there will always be new discoveries to be experienced even for hospital staff who might see the installation on a regular basis. Diversity and transition were the themes, design concepts, and goals I built into “The Streets and Hills of San Francisco”. 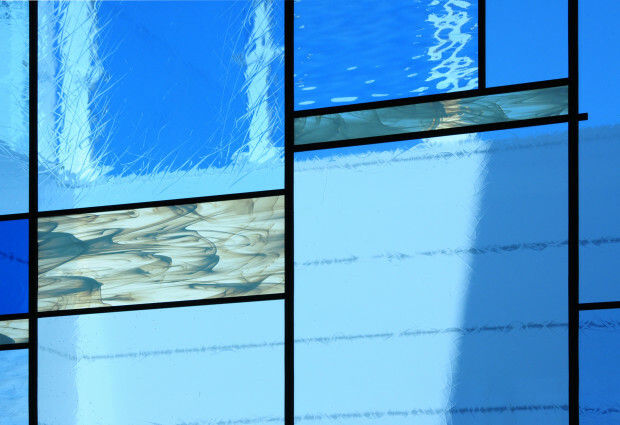 After being selected as a finalist for this project by the San Francisco Arts Commission I prepared sample panels along with my design renderings. 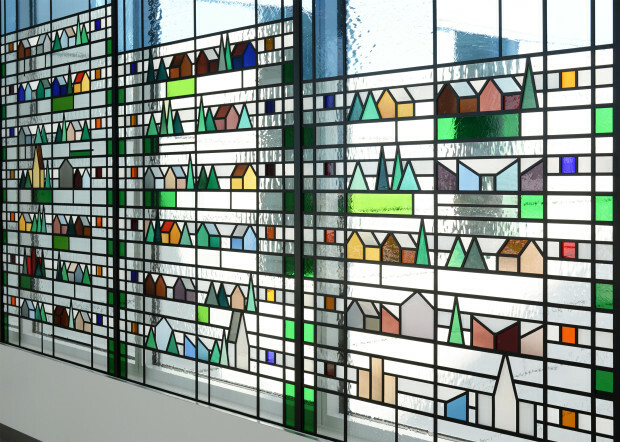 These were presented to a jury with representatives from the architects, as well as hospital staff, members of the community, and arts professionals. Once selected and awarded the commission, I collaborated closely with a chain of professionals, including the San Francisco Arts Commission, Fong and Chan Architects, Webcore Builders, and Royal Glass (the glazing contractor) to establish all the final dimensions and construction details. The panels were built in-house at Arthur Stern Studios with water jet cut aluminum fabricated by Triton Waterjet and powder coat painted by Melrose Metal Finishing and Painting. 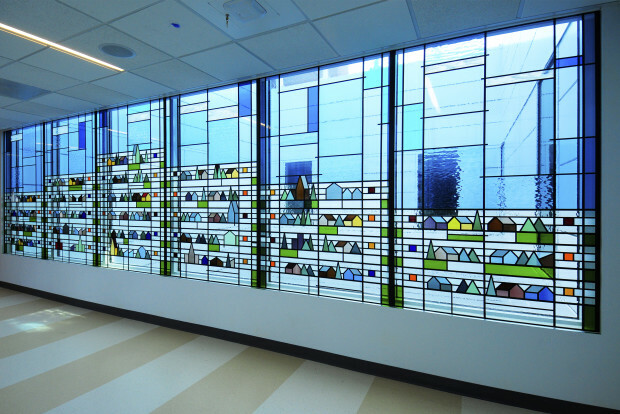 The panels have the appearance of traditional stained glass, but at this scale I elected to use a laminated glass technique where hand blown and textured art glass was first hand-cut to size, and then laminated to the large pieces of tempered plate glass. Full size pieces of sheet aluminum were perforated into the matrix or line work based on my CADD drawings. The aluminum was then powder coat painted black and attached to the front of the panels with VHB construction tape. The large completed panels were quite heavy and required special care in handling, crating, shipping, and installation.